Trailhead kiosk on McNab Street. 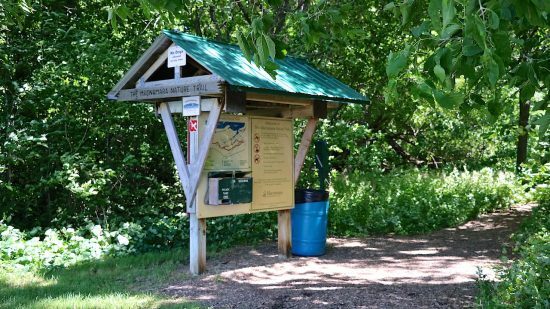 Begin your journey on the Macnamara Trail at the trailhead on McNab Street. Download the trail guide to your smart phone from the club’s web site or borrow a paper copy from the kiosk. Walk half a kilometre until you see a sign to the Nopiming Loop. 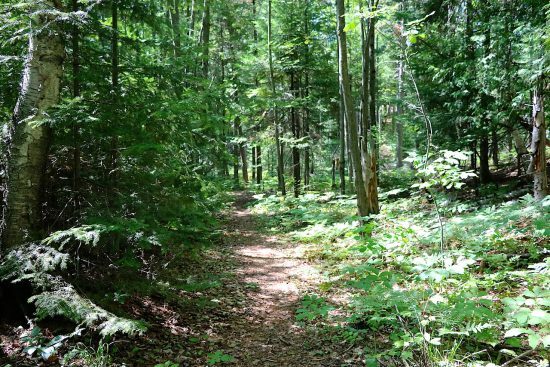 Leave the main trail by turning left and descend a gentle slope to the West Link, a 60 metre span that connects you to the north side of the property and to the Nopiming Loop. Welcome to the north side! Nopiming Loop along the edge of the marsh. Turn right onto a narrow dirt footpath that skirts the edge of Goodwin Marsh. Note the difference between the forest that rises to your left and the wetland plants on your right. On windy days listen to the whispering White Pines. Stroll under the woodland canopy of fir, cedar, pine, and birch for about 10 minutes until you reach the entrance to the Goodwin Marsh Lookout on your right. 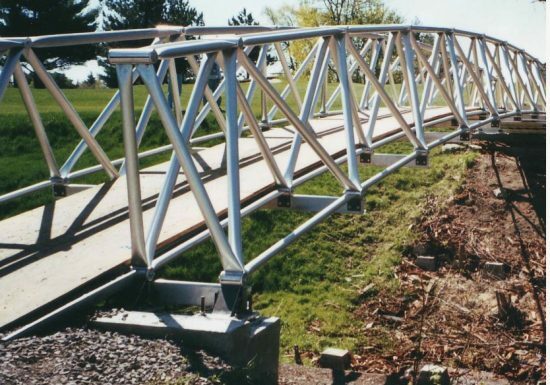 Space frame bridges like this from Triodetic will connect the islands. 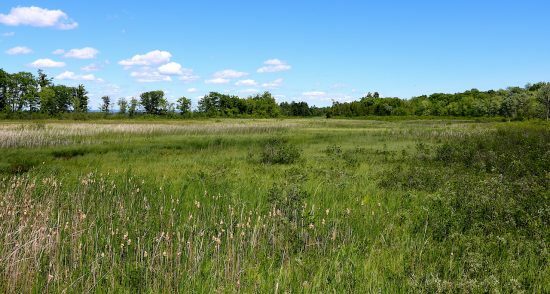 You begin your 250 metre trek to the lookout at the centre of the marsh by emerging from the forest and entering the open marsh filled by cattails. Take the path to the first of several small islands connected by boardwalks and space frame bridges. Sit on the bench and enjoy the scenery under the White Cedars. Continue to two islands joined by elevated bridges offering beautiful views of the marsh. Wild Columbine blooms in May along the trail to the lookout. Exit the second bridge and walk carefully along the narrow, rocky trail. 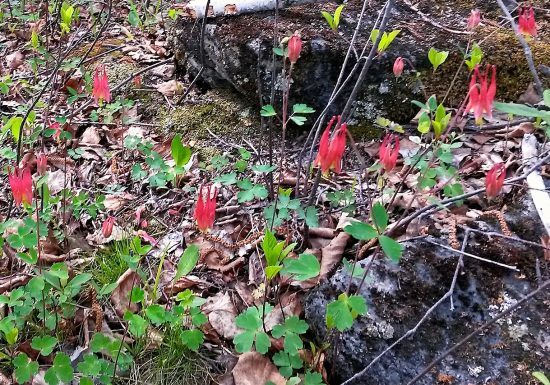 In May red and yellow blooms of Wild Columbine accompany you to the end where you will find an observation deck. 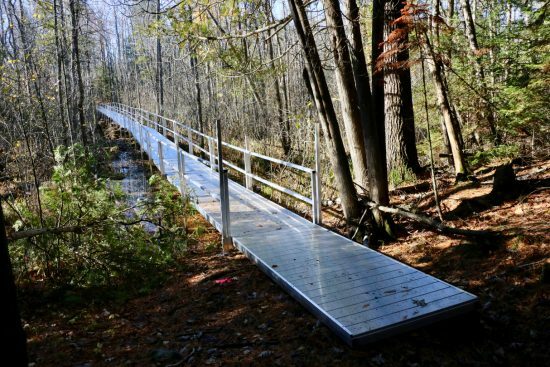 Rub the leaves of the Sweet Gale bushes to release their spicy aroma before climbing the stairs to the deck for a 360-degree view of the marsh, which opens into the Ottawa River. An Osprey nesting tower is visible less than 100 metres away. If it’s early in the morning you can watch the sun rise in the east. In spring or early summer listen to the dawn chorus of birds greeting the new day by proclaiming their territories. In the fall large flocks of migrating birds can be seen and heard as they rise from their overnight rest on the Ottawa River to continue on their journey south. Gaze down across the marsh. Can you find channels made by muskrats or beavers in the wetlands? Descend the observation deck where a bench invites you to sit quietly, eat a picnic lunch, and enjoy the benefits that a walk in nature provides. Looking east down Goodwin Marsh. Once you’ve drunk your fill of the sights, sounds, and smells of the marsh and its wildlife, retrace your steps to the Goodwin Marsh Lookout entrance and turn right to continue around the Nopiming Loop, about one kilometre of gently rolling landscape. The loop skirts numerous small ephemeral ponds, home to salamanders and frogs. Rock outcrops showcase the local dark marble that supported the historical marble works in Arnprior. 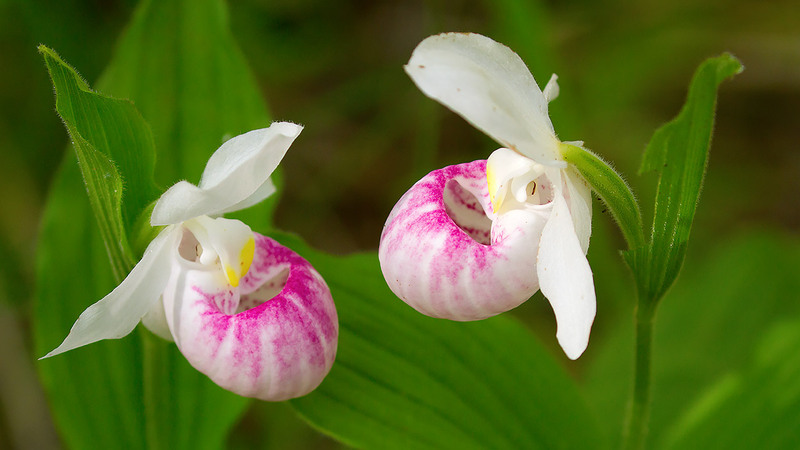 In the fall enjoy the bright colours of Sugar Maples and Red Oaks in the upland forest and look for mushrooms and the bluish-white berries of Round-leaved Dogwood shrubs along the trail. Dark evergreen Hemlocks with their feathery but dense foliage provide cooling shade in the summer and reassuring substance and colour in winter. You will finish the loop back at the entrance to the West Link, your body, mind, and spirit renewed by a peaceful walk in nature.